There was a time when you could sell the south's best BBQ in the shadow of the Confederate flag and nobody cared, it was just good BBQ. Back in the day when ol' Maurice bragged that he only made BBQ from the right side of the hog, never the left. Those days are gone. When it comes to Maurice's Piggie Park BBQ: The Next Generation -- there's no looking back. The black sheep of the family has retired and they're putting all that behind them. Confederate flag? What Confederate flag? 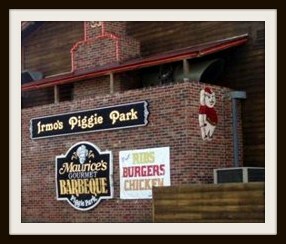 The flags have been removed from all eleven of Maurice's BBQ stores in Columbia. Maurice's grandchildren are in the cockpit and keeping mum about ol' grandpa. Maurice, in his early eighties, is "relaxing, enjoying some time off." That's the most you'll get if you inquire about grandpa. For all I know, he's got duct tape on his mouth. He's definitely in the closed chapter of the Maurice's BBQ book. Google's the only one keeping that chapter open. And maybe a few really angry people. Maurice's rebranding began around late 2012. Out of respect for Maurice, it's been a slow change, gradually removing his political paraphernalia, replacing it with gorgeous photos of food and a diverse population eating that food. Using social media to spread the image of Maurice's as just country folk cooking really good food, Shvetz is building customer relationships by sharing a daily glance inside the operation, chatting on twitter as though you're an integral part of the internal operations, sharing deals and coupons on facebook and foursquare. Shipping sales increased as Internet marketing took Maurice's Southern Gold global. Local sales, too, with over 10,000 lbs. of BBQ leaving Maurice's kitchens on July 4th. The pit-cooked BBQ is still cooking 24 hours a day. "Uncle Paul" still gets up at 4 a.m. to stoke the fire and prepare the orders for the day. The recipe is still a big secret. The hush puppies are still the best in the land. Maybe the universe. The close of last night's meeting introduced one last question, possibly the most important one of the night, certainly the one we'd all been thinking, "But seriously, with a Big Joe Basket, can you get hush puppies instead of fries?" Shvetz, the pro at handling conflict in social media, responded with a smile, "I'm sure we can do that for you." Love that BBQ and so glad the family is carrying on, as a matter of fact I'd like a Little Joe right now wish I was closer!